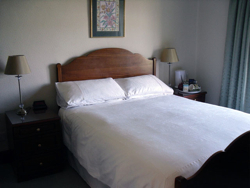 Our comfortable, fresh and bright rooms are all offered with a generous hospitality tray, a well-equipped bathroom cupboard containing anything you might have forgotten, TV with Freeview, hairdryer, bathrobes and an alarm clock, but no obligation to use it. 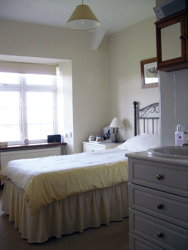 A bright double bedroom, with views over fields towards the Mendip Hills, including an ensuite shower. From £70.00 including breakfast. 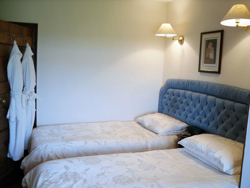 A comfortable room with twin single beds, ensuite shower room and country views from the window. From £70.00 including breakfast. A double room with washbasin, sharing the bathroom with the single room. From £65.00 inlcuding breakfast. 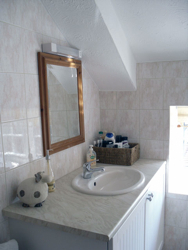 A charming single room complete with basin and mirror, sharing a bright, modern bathroom with the double. From £45.00 including breakfast. In the evenings, guests are welcomed to the lounge for TV and the warmth of a log fire (in the appropriate season).